last weekend right next to CarSales' head office with the message “let lightning strike those who sell your contact details to dealers”. With the billboard up, it then floated a blimp over the office with a lightning bolt on it, with both message and blimp in sight of drivers-by. CarSales has now taken CarsGuide to court over the campaign, alleging the claims made were incorrect. "We have sent a cease and desist letter to carsguide.com.au but they have thus far refused to remove the ads. 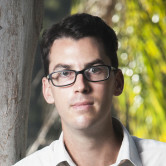 We believe that we had no choice but to go to the Supreme Court to stop carsguide.com.au and their attempts to mislead the Australian public,” carsales.com.au CEO Greg Roebuck said. "Carsguide.com.au has gone out of its way to imply we’re in the business of selling consumer contact information to multiple dealers. This is untrue. Consumer contact information is only provided to the owner of the specific car that is enquired upon and to no one else. CarsGuide said it is “determined” to fight on amid legal battle. It said despite the “David and Goliath battle” that is emerging in the online car classifieds industry, as Carsales “tries to take CarsGuide’s thunder” by taking CarsGuide to court over its latest advertising campaign, it is persevering. Developed by BWM Denstu, CarsGuide’s latest campaign takes aim at the practise of hiding the name and exact location of a dealer from a user until they provide their contact details, which are then sold to the dealer as a ‘lead’. CEO at CarsGuide Lauren Williams said: “We knew most consumers had no idea that when they inquired about a car on Carsales their contact details were being sold to the dealer. Our campaign aims to drive broad awareness on this little known transaction. It said when CarsGuide launched a few years ago, it replicated the same business model, but in January 2015, after a year of development and planning led by Williams, CarsGuide launched a new open model. “When I started as CEO we could see that the old model of hiding information and selling contact details was not a sustainable practice for a modern online business,” she said. “We re-engineered our business and dealers now pay for views of their cars and not for consumer’s contact details,” Williams said. An element of the campaign is the Punt Road billboard, which directly takes aim at competitor Carsales. 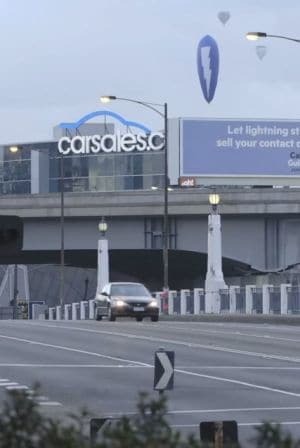 The billboard reads “Let lightning strike those who sell your contact details to dealers”, with a lightning embossed blimp pointing directly at competitor Carsales’ head office. The campaign is currently live across TV, radio, and outdoor. Check out our story on the campaign here. The first hearing is set to take place in the Victoria Supreme Court. Carsales.com.au is taking Carsguide.com.au to court over what it says is a grossly misleading advertising campaign. As featured in AdNews, CarsGuide put up a billboard on Punt Road in Melbourne last weekend right next to CarSales' head office with the message “let lightning strike those who sell your contact details to dealers”.